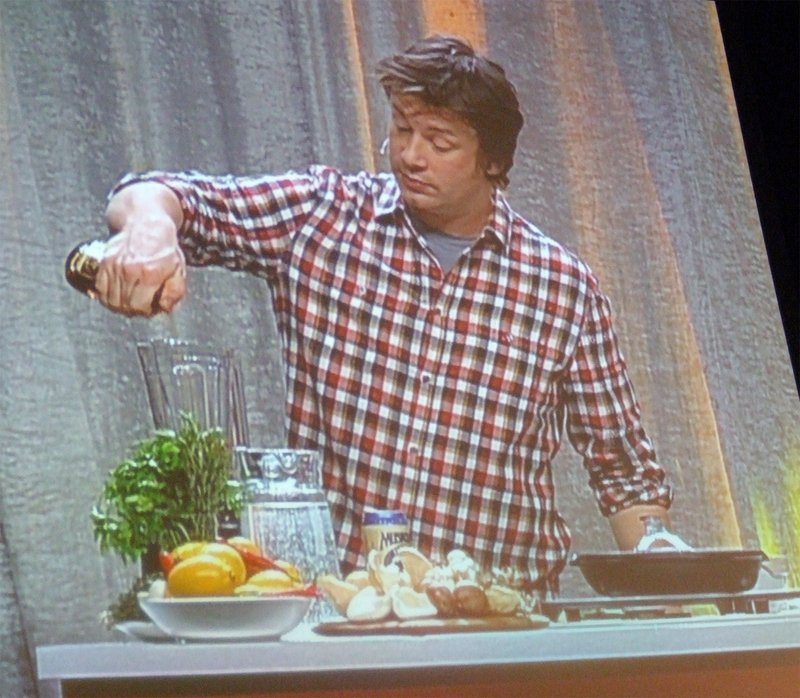 About 3,500 eager fans gathered at the Metro Toronto Convention Centre last Thursday, November 18 to see Jamie Oliver as part of The Art of Cooking series. The powers of a star chef. The crowd was about a 50/50 split between men and women, so it speaks volumes as to how admirable and inspiring a person Jamie is to everyone (and not just a cutie who can cook damn good food). It's no surprise from a previous post that I'm a big fan of Jamie myself, and I was thrilled to have the opportunity to see Jamie live and in person. The TAOC event opened up with Bob Blumer, host of Glutton for Punishment, as he shared funny stories with us and told us about the upcoming season of the show. The new season will have six episodes of what Bob calls "extreme" Glutton for Punishment, as Bob attempts to break six new Guinness World Records, including the most table-side Caesar salads made in an hour, the most onions peeled, and the most pizzas stretched, topped and baked in a hour, a feat he tried to break earlier this summer here in Toronto. 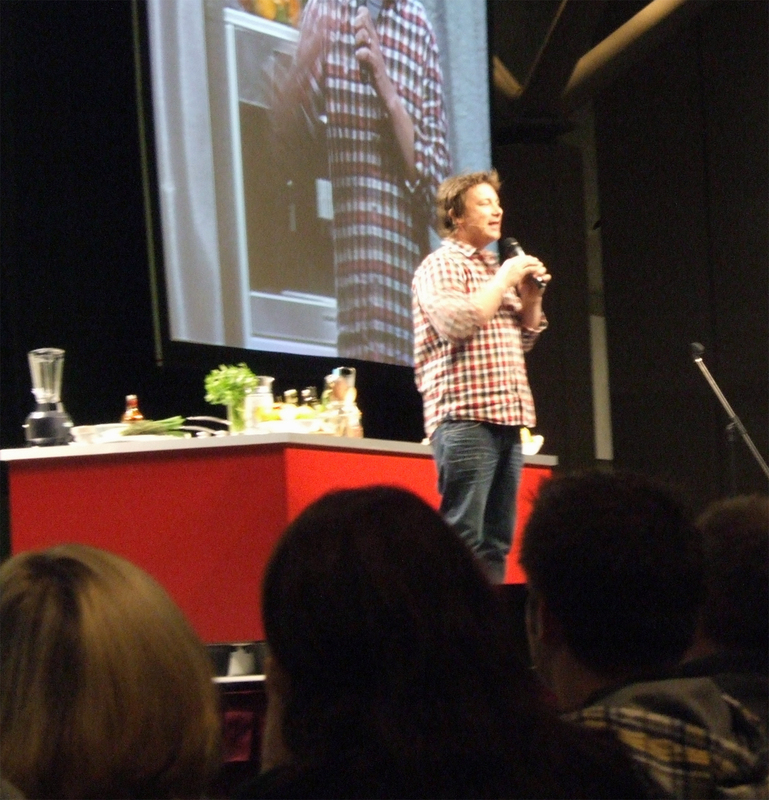 Bob then proceeded to have a cooking challenge right there on the stage with a fellow audience member. 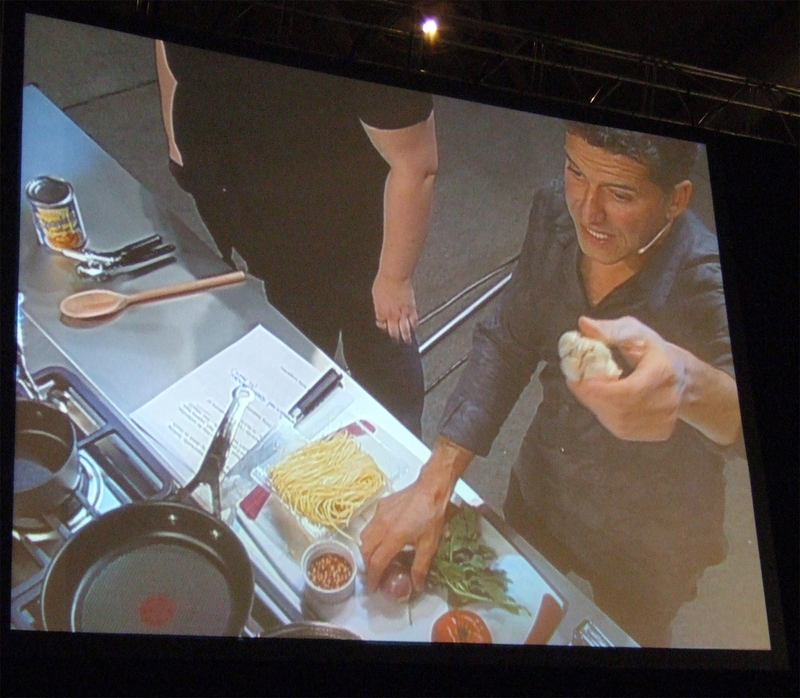 The challenge: He would cook a fresh pasta meal from start to finish in the amount of time it would take to reheat a can of spaghetti. So while a can of spaghetti was heating on the stove, Bob boiled fresh pasta and made a quick and easy marinara sauce with garlic, shallots, tomato (great trick is to directly grate a tomato right into the pan for an instant sauce!) basil and parmesan. It was pretty much a tie in the end, but Bob proved how easy and fast it is to cook a meal using fresh ingredients rather than grab for a ready-made frozen or canned meal in just 3 minutes. 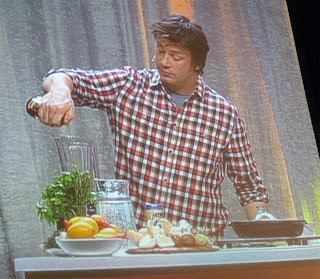 Bob was entertaining and you can catch more of his antics starting January 3, 2011 on the Food Network. It wasn’t long after that the star of the evening came out, much to the excitement of the crowd. The good portion of the evening Jamie spent answering audience questions. Questions touched upon everything from “boxers, briefs or other?” (JO: “Freeballin’”), to secrets to his great hair, to general cooking tips in the kitchen and many other curiosities. Interesting to note that Jamie has not tried anything quintessentially Canadian yet (someone please immediately send him the following: poutine, beavertail, tourtière, nanaimo bar, and maple sugar tart). 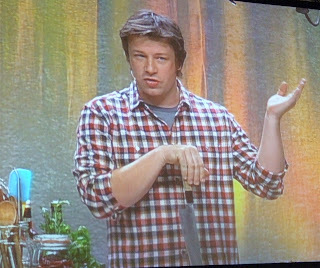 Jamie also spent some time talking about his work with the Food Revolution, which has truly made him a household name around the world with his movement to educate people on the truth of food, what they're consuming from processed foods, and showing them how easy it is to cook a fast, easy and nutritious meal using fresh ingredients in order to get them to eat healthy. The key to the food revolution is the “pass-it-on” movement. As Jamie explains, there’s no replacement to the one-on-one interaction between human beings. If you don't know how to cook, find someone who does and have that person teach you in the kitchen. 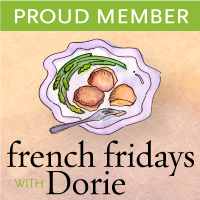 And if you do know how to cook, spread the knowledge—to friends, family, kids, anyone who is willing to learn. There are already over 625,000 who signed the Food Revolution petition, and it is Jamie's goal to reach 1.5 million signatures by this time next year. Jamie also briefly talked about his new show that is currently airing on Food Network Canada, six episodes that document his trip across America to learn more about the American culinary culture, which he found was a “melting pot of different waves of immigration,” creating diverse flavours in all parts of the country. The trip brought him to the various ethnic neighbourhoods of New York, Homeboy in L.A., soul food in the south, the Navajos, the cowboys in the mid-West, and more. His trip also resulted in a cookbook of the same name. 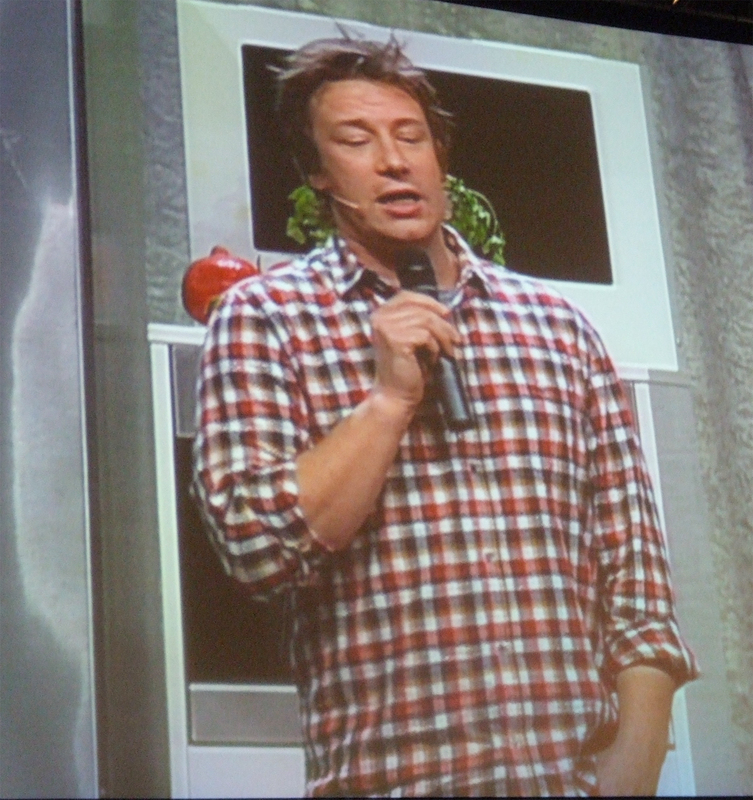 In between answering questions and charming us with his anecdotes, Jamie did a cooking demonstration of two recipes from his new book. The first dish he made was a Peruvian Ceviche with fresh red snapper and lime juice, while the second was a gorgeous Steak with Two Sauces (a peanut sauce and a “chopped salad” salsa) he learned from Homeboy in L.A. The smell of the grilled steak slowly started wafting to my area as Jamie was putting together the last touches to his dish. The lucky few in the V.I.P. section who got a chance to taste the dish cooked by Jamie’s own hands were certainly lucky indeed! 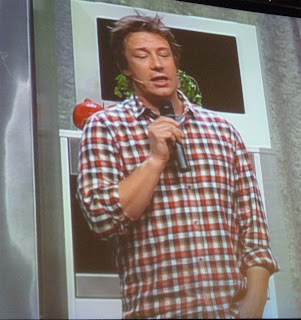 While the event itself certainly could have been better organized and have had a better (and interactive) format, it was still a pleasure to see Jamie live in person, considering I’ve been a great fan of his since his early Naked Chef days. 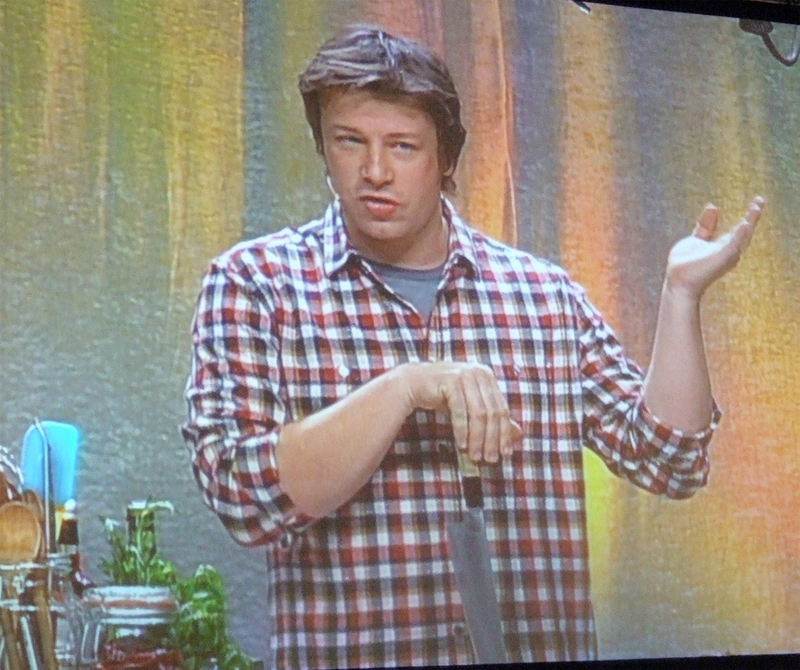 I think he’s done a lot of great things with the Food Revolution, educating people about the truth of what they’re eating and how easy it is to cook our own meal. 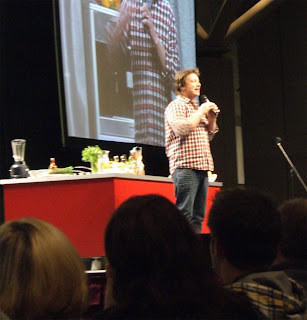 And the chance to hear him talk and see him cook, you can really see his passion he has for all things food and cooking. 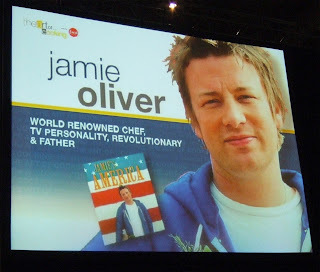 Thank you to The Art of Cooking for the opportunity to see Jamie in person. Inspired by Jamie’s event, I went home and cracked opened one of the handful of Jamie books I own. I made a delightful English onion soup with sage and cheddar from Jamie at Home. I found it to be a lighter counterpart to “French” onion soup, as the oniones are slowly cooked to ensure it doesn't brown and caramelize, but still retain a lot of flavour. The sage adds some great depth to the soup without being overwhelming as it mellows out after the long simmer. I added a glug of brandy towards the end of the cooking for some extra flavour, and used applewood cheddar for some smokiness. This is an amazingly delicious that really brings out the sweetness of the onions. Great for lunch or a quick starter. 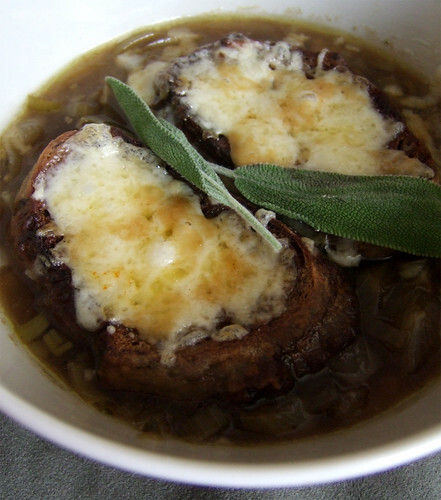 You can find the recipe for Jamie's English onion soup with sage and cheddar here. Mardi @eatlivetravelwrite November 24, 2010 at 8:32 a.m.
Glad you enjoyed Jamie, despite the adoring masses (WAY too may people for that kind of event). And this soup? YUM!